Flash #2 is out this week, and Comicbook.com has a preview of the issue. Writer Joshua Williamson, artist Carmine Di Giandomenico and colorist Ivan Plascencia. Cover by Dave Johnson, variant cover by Karl Kerschl. This entry was posted in Out This Week and tagged Preview on July 11, 2016 by Kelson. 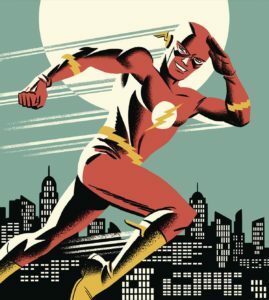 DC is re-releasing a bunch of its early Barry Allen stories from the 1950s and 1960 in the first volume of a new series of softcovers, Flash: The Silver Age. Stories by John Broome and Robert Kanigher with art by Carmine Infantino, and a cover by Michael Cho. 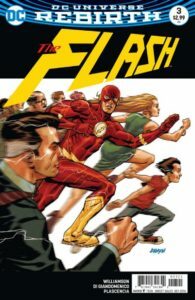 Presumably this series replaces the “Flash Chronicles” series that previously reprinted the early Barry Allen Flash stories in softcover trade paperbacks and got up to 1961. I like to think that someday DC will actually keep going with one of these reprint series and we’ll get past the mid-1960s. This entry was posted in Out This Week and tagged Barry Allen, Collections, Silver Age on June 14, 2016 by Kelson. DC has a preview for Titans: Rebirth #1, out this week. 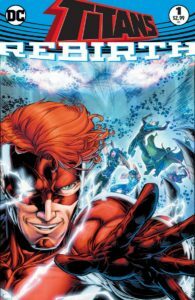 In this one-shot issue, direct from the events of the DC UNIVERSE: REBIRTH #1, Wally West has returned from the Speed Force and will try to reunite with his former team: The Titans! Now years later, Donna Troy, Arsenal, Garth, Lilith and Nightwing know that their memories had been altered, but are still unaware of the friend and teammate they’ve long forgotten. When Wally shows up in their apartment, the Titans attack! He’ll have to find a way to stop his friends, while proving that he is the “missing Titan”. Find out more from writer Dan Abnett and artists Brett Booth (pencils), Norm Rapmund (inks), Andrew Dalhouse (colors) and Carlos M. Mangual (letters) in this week’s one-shot TITANS: REBIRTH #1! 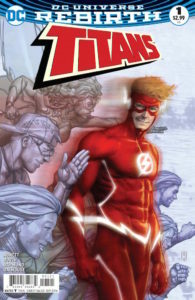 This entry was posted in Out This Week and tagged Preview, Titans, Wally West on June 13, 2016 by Kelson. 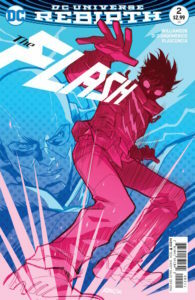 Crave Online has a preview of Flash #51, available today. The Riddler has set up shop in Central City, and makes his move against the Flash *and* the Rogues! This entry was posted in Out This Week and tagged Preview on May 4, 2016 by Kelson. The Digital Flash Backlist is Back in Action! After several years adding more Flash back issues to their digital catalog on an almost weekly basis, DC stopped. Only the new comics would show up on ComiXology, so I stopped keeping an eye out. Flash 50th Anniversary Special, in which three generations of Flashes battle the same villain across the ages, and a future Flash John Fox makes his debut. 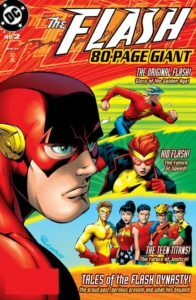 Flash 80-page Giant #1 and #2, each featuring a mix of Jay, Barry, Wally and Bart, plus max Mercury and Jesse Quick. DC First: Superman/Flash, featuring the first race between Superman and Jay Garrick. 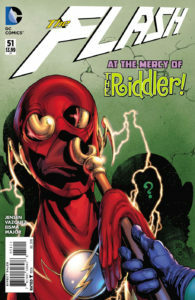 Flash Secret Files #3, which introduced Hunter Zolomon. Flash (1959) #107, which was skipped for some reason the when they started releasing the Silver Age Barry Allen issues. And there’s also a digital collection of theMorrison /Millar /Ryan / Mhan run. The individual issues have been available already, but now you can get them all in one package. This entry was posted in Out This Week on May 1, 2016 by Kelson.